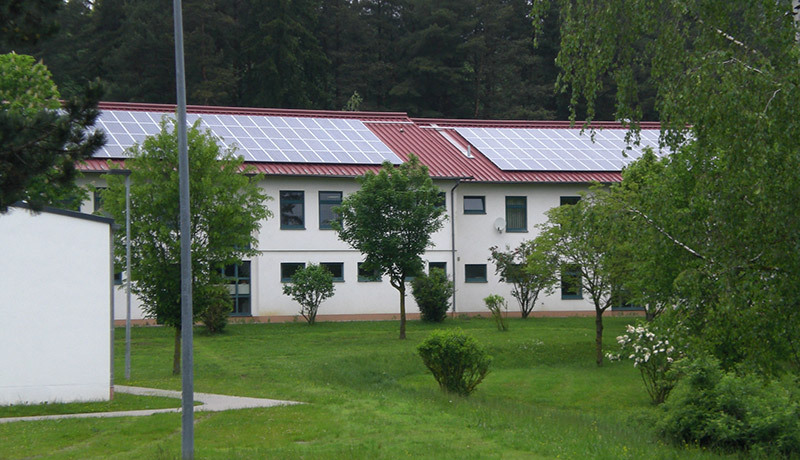 A roof-mounted photovoltaic system provides electricity to U.S. Army Garrison Bavaria housing. The Department of Defense mission is to provide the military forces necessary to deter war, protect the security of the American people, our allies, and advance our interests globally. To execute its mission and ensure compliance with Executive Order 13693, Planning for Federal Sustainability in the Next Decade, environmental sustainability must be an integral part of the defense mission. Individual service organizations must have the energy, land, air, and water resources necessary not only to train but also to successfully operate in all austere environments. This challenge becomes increasingly complex with competition for local resources and the enormous complexities of contingency operation resource logistics. Advancing technologies and practices that further sustainability goals. Triggered by recent destabilizing world events in Europe, DOD has responded with the 2014 European Reassurance Initiative reinforcing the continued support of Operation Atlantic Resolve. These strategic initiatives reassure our NATO Allies and partners especially along NATO’s eastern flank that the United States is committed to the security and stability in the region. A critical component of the initiative is not only providing the necessary funding for a prolonged rotational presence of United States forces in Europe but also improving and constructing supporting infrastructure including airfields, facilities, staging sites, and training ranges. Inherent in these initiatives are the overarching requirements to integrate environmental sustainability protocols and best practices aligned with the DOD Strategic Sustainability Performance Plan. The United States Army Garrison Bavaria in Grafenwoehr, Germany, has been setting the example for enabling the plan’s requirements and putting these initiatives in practice to ensure support to the warfighter. USAG Bavaria is a key NATO training facility and is no stranger to overall environmental program excellence having been selected as a Secretary of Defense Environmental Award winner in 2000, 2006 and 2010. It has been recognized for its outstanding environmental facilities and ecological infrastructure to sustain existing training lands while maintaining training capabilities for emerging needs such as Operation Atlantic Resolve. Furthermore, the installation has improved internal business processes by fully implementing an International Organization for Standardization-14001 compliant Environmental Management System. The result is reducing environmental impacts and risks to ensure safe and healthy sustainable communities by reviewing all activities and projects for potential impacts and then programming appropriate remediation measures. Additionally, USAG Bavaria is a good neighbor to its German Host Nation authorities, continually working to improve its overall reputation with the public and preventing encroachment through partnership. USAG Bavaria Grafenwoehr installation also was chosen as a Net Zero pilot installation for waste in 2010. The objective of this initiative is to produce zero landfill during the course of a year through reduction and converting waste streams into alternative energy sources. Since 2010 the garrison has been able to reduce waste by as much as 60 percent and also has established an impressive recycling program. Material that cannot be recycled is sent to a local shredder plant and then to an Energy Incineration Plant where it is burned resulting is three different products: ash for fertilizer, steam, and electricity. The installation also has put energy conservation practices in place including several solar-based energy systems for several barracks and the physical fitness center. The energy produced from these systems is used to heat cold water and produce electricity, which is fed into the German grid system resulting in a credit for the garrison and ultimately lower energy costs. In addition to these outstanding environmental sustainability achievements, USAG Bavaria Hohenfels installation received the Fiscal Year 2014 Secretary of the Army Energy and Water Management Individual Award for Energy Efficiency/Energy Management. The team developed and implemented several effective low and no cost energy conservation measures during that fiscal year, which resulted in a combined annual savings of $426,000. USAG Bavaria has continued to demonstrate not only operational excellence in support of the warfighter but also implement a robust and innovative environmental program. The installation is leading the way in Europe by meeting and often exceeding promulgated environmental program requirements, ensuring collaboration with local host nation authorities, and providing Soldiers the best training facilities possible.